Here's an itinerary of Kuching that I promised. It is suitable for those who are going to Kuching for 3 days 2 nights (if you arrive in Kuching early and left late) or 4 days 3 nights (for those who arrive early and left early). For the former, it might be a little rush, but that is all depend on your interest and time allocation. Yesterday, I attended a seminar in Menara Welds regarding Japan Internship Program and thought of sharing this information to those who are interested in joining this program, putting a hold on the planned post of Kuching itinerary. This internship program is organised by the Ministry of Economy, Trade and Industry (METI) of Japan, partnering with Pasona, to attract young foreign talents (20 - 40 years old) from developing countries (OECD/DAC-listed countries) to internship in Japan for a period of 3 months. During the whole trip in Kuching, there were only two places that we went for food, with the most visited area in Padungan Street and some in Carpenter Street. Since Sarawak's food can be found mainly in these 2 areas, and the restaurants are closely located with one another, going to any Chinese restaurants or foodcourt allows you to have these Sarawak's delicacies. Some of the food I tried might not be the best but it may taste good in the other restaurants. The taste is quite similar to Wantan Mee without the wantans and the black sauce. Since I love Wantan Mee, I have no complains with this noodle. The dipped sauce in Sarawak is a little special. In West Malaysia, the dipped sauce is usually cut chili with soy sauce, but in Sarawak, it is vinegar with cut chili. 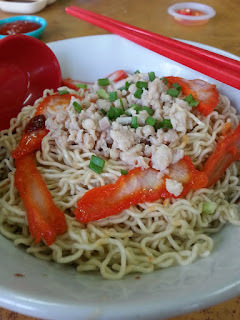 With a look almost similar to Kolo Mee above, its taste is close to Cintan's instant noodle. Hello!! Sorry for the super late post. It's the final day in Kuching. This time is a totally different theme from the last 2 days, a little back-in-time adventure - Cave adventure. Wind Cave Wind cave is a very dark cave located in Bau. It is famous for being home to thousands of bats and other dark-loving creatures. 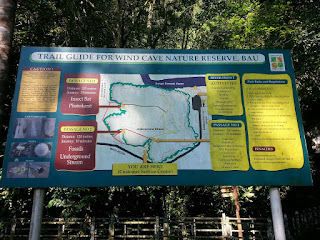 Wind Cave has 3 passages in total, in which each passages has different attractions. We first went to the riverfront as we thought that was the entrance but it was not. The entrance is not that obvious but clear enough if you pay attention. As we arrived, we heard a lot of squeaking sound. I couldn't imagine how many bats are living in this cave. After we paid for the entrance fee, we entered the cave, firstly without the torch.